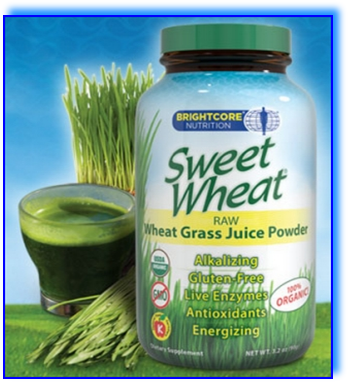 Fresh wheat grass juice without the inconvenience of juicing. Nothing added. Certified 100% organic. watered with mineral rich, deep artesian well water, nourished by the rays of the sun and only harvested at the point of maximum nutrient content. The juice is freeze-dried to preserve the enzymes and heat sensitive vitamins which other drying processes can destroy. There are no fillers, binders, or other additives. It is fresh wheatgrass juice minus only the water. is biologically equivalent to freshly juiced wheatgrass. is periodically inspected by an outside party for organic certification: No pesticides, fungicides, or chemical fertilizers, sewage or sludge fertilizers, irradiation, or genetic engineering are used. Wheatgrass, the ten day old wheat plant, has an extremely high nutrient concentration and a range of easily assimilated nutrients which cannot be found in the mature plant, a unique combination making wheatgrass a superfood.Even people with allergies to wheat, can eat wheatgrass as it contains no gluten at this dark green, leafy vegetable stage of growth. capsules. Just take two capsules and you have the equivalent of an ounce of fresh wheatgrass juice. A vast array of minerals, including zinc, phosphorous, and calcium.